The minigun is a rapid-fire long-ranged weapon with great direct damage. It is often compared to the rifle as they are very similar except that the minigun has much higher rate of fire and firepower. 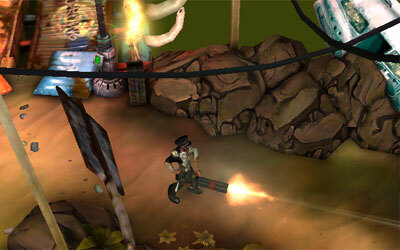 The minigun is also heavy in that wielding such a weapon reduces the speed of movement. The movement speed during shooting is the lowest among all classes of weapons (the pistols have a flexibility advantage of 800% over the miniguns). The minigun is one of the strongest weapons but can only be bought with crystals. The minigun is an all-purpose weapon with high rate of fire and well serves the role of a primary weapon. It is an important piece of weapon in free-for-all deathmatch due to its high fire rate. Many players with the minigun would try to stay in the center of the map in coop multiplayer and shoot in all directions but note that the bullets from a minigun does not reach the end of the map if one does so. Maybe because it is the most expensive and people just assume that it is the best. I use the Dust Devil Armor because of its speed advantage. We can discuss this on the armor page. Aw yah :) thx good idea. Question why don't I ever see anyone with the death knight armor, it's pretty good and I'm getting that. All I ever see is the boring paladin, why don't they pick different gear, I mean I know paladin gives u most health but still. Oh, you are so quick. Since you are a fan of miniguns, I am not going to question your decision. For me, I would say getting the Nine-Inch or Behemoth first, and even if you like the Gojira, you can save more crystals first and just go for it. Definitely not armor, save it for the last. Anyway, hope you enjoy the Cyclone. Well I bought the cyclone and so far I think it's a good decision.